As I mentioned in a previous post, we ran out of beef and have been using venison in its place. It has been met with some resistance, but after realizing that has no affect on whats for dinner, they have conceded. You hardly notice it in spicier foods like tacos and chili, but I have had to dress it up some in regular dishes. Today I made "Beef" Stew. 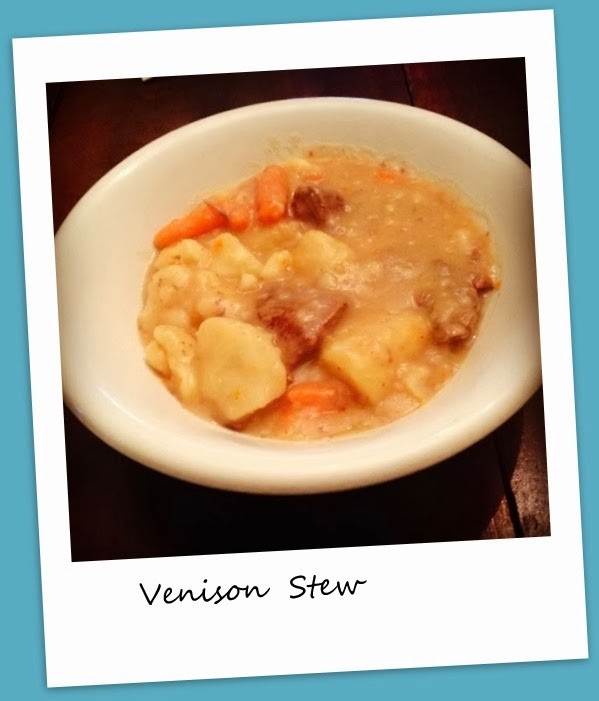 We don't make big announcements about the fact that it is really "Venison" stew. If you have an Electric Pressure Cooker follow the instructions that are specific to your model. Turn Pressure Cooker on the "Brown" setting. Add oil. Turn the "Brown" setting off and set the Pressure Cooker to 10 minutes on the "LOW Pressure" setting. Place lid on cooker (make sure the regulator knob is set on "seal). After pressure cooker shuts off, CAREFULLY, release the steam (follow your cookers instructions). After the Pressure Cooker shuts off (shows 0 time left and beeps) release pressure CAREFULLY (follow your cookers instructions). Add 1/8cup flour to one cup cold water. Stir well. Add to ingredients in the Pressure Cooker and stir well. If too thick add more water. It sounds like you can basically use it the same as beef but just with more flavor enhancements. I have the old fashioned kind of pressure cooker and I rarely use it anymore although it is great for cooking a chicken quickly to shred. I would love to have one of the new ones with all the settings. Thanks for sharing on the Four Seasons Blog Hop.